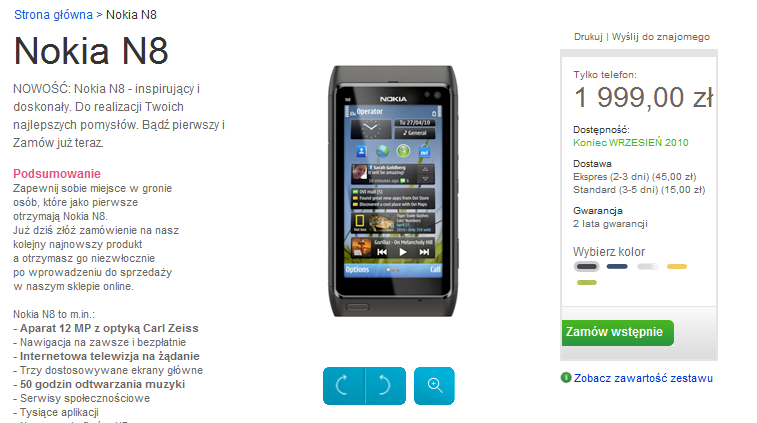 Nokia Poland has opened pre-order booking for Nokia N8 at 1999 Zloty (Polish Currency) which is approximately 652 USD. Thus, the cost around the globe for Nokia N8 averages at about 620-650 USD. The phone has previously opened for pre-booking in Italy, France and Germany. The Polish version of the phone comes with all the standard accessories and will deliver by the end of third quarter of 2010. The phone yet to be opened for pre-booking in UK, US and India. India is one of the largest markets for Nokia and yet there is a delay in the pre-order opening.